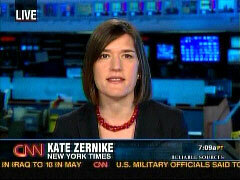 Reporter Kate Zernike continues to take heat for her false allegation, in a February 18 post on the New York Times's "Caucus" blog, that Jason Mattera of Young America's Foundation, a speaker at the annual Conservative Political Action Conference in Washington, engaged in racial stereotyping during an anti-Obama tirade. Her bizarre charge appeared under the headline: "CPAC Speaker Bashes Obama, in Racial Tones." She then quoted Mattera from his CPAC panel appearance. He then mocked what he described, with a Chris Rock voice, as "diversity," including, he said, college classes on "cyber feminism" and "what it means to be a feminist new black man." Mr. Kerry's prepared remarks to California students on Monday called for him to say, "Do you know where you end up if you don't study, if you aren't smart, if you're intellectually lazy? You end up getting us stuck in a war in Iraq. Just ask President Bush." In his delivery, he dropped the word "us." You know, education -- if you make the most of it, you study hard and you do your homework and you make an effort to be smart, you can do well. If you don't, you get stuck in Iraq. If Kerry had said what Zernike claimed he had said, there would have been no outcry in the first place. (The Times ran a long correction the next day.) Zernike also fiercely defended Kerry against allegations by the Swift Boat Veterans for Truth even after he lost the 2004 election. Boston Herald editor Jules Crittenden joined the festivities, digging up a five-paragraph correction to a Zernike hit piece from August 2000 on the Boy Scouts that overstated opposition to the group for excluding gays. One connecting factor in the three botched stories: Each error benefitted the liberal Democratic side. How could Zernike make her "Chris Rock" mistake? My guess: She was so enraged at Mattera's routine, in which he mocked Obama for cocaine use (admittedly not to everyone's tastes), that she heard what she wanted to hear. Perhaps she didn't know that Obama confessed to cocaine use in his first autobiography, "Dreams From My Father" and thought Mattera was making some arbitrary stereotypical accusation about a black person. Even if true, that's no excuse for such shoddy reporting. For those of you who don't know me, I was born and raised in Brooklyn, New York. In fact, I spent 18 years of my life there. I, like most New Yorkers, have a discernable speech pattern, a reality that shouldn't come as a surprise to an employee of the New York Times. My alleged "Chris Rock" voice is actually the way I sound every day. Zernike could have figured this out for herself had she spoken with me in person (trust me, I'll talk to anyone), or at least she could have taken a minute to pull up one of my YouTube videos. Instead, Zernike, who must consider herself some kind of dialect expert, attempted to tarnish my name and stigmatize CPAC for inciting racial animus towards our President. All based on... my Brooklyn accent! You can't make this stuff up. And thus, here is my formal request for the New York Times to completely retract Zernike's vile smear. There is no more serious charge in American society than the accusation of racism and Zernike leveled such a charge against me, a person she has never met, on the basis of something as flimsy as her limited understanding of my speech pattern. Not only should the Times correct the record promptly, but they should hand Zernike a pink slip for such a bald-faced character assassination. You can judge for yourself whether Mattera was engaging in "racial stereotypes" here.